After another successful Miami Music Week, Spanish tech house duo Chus & Ceballos are launching an new events brand in association with their label Stereo Productions. Hot on the heels of their latest and new album, ‘Nomads’, this new project is entitled Iberian Republica and will consist of worldwide showcases at various top venues. Playing each event with the DJ bosses themselves will be DJs such as Rafa Barrios and Supernova, and the whole tour will apparently have unique production, aiming to take the tour above and beyond what would be expected from a regular DJ gig. 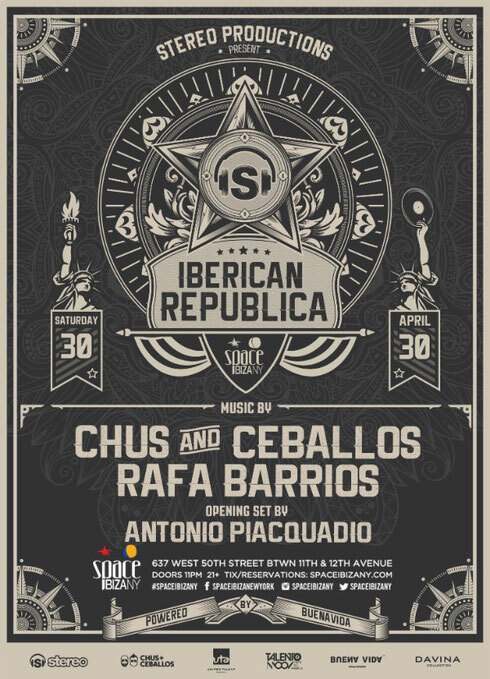 The next party will be at Space Ibiza NY at the end of this month and also this month, Chus & Ceballos are going to play England’s capital on 22 April at EGG London. It has been a while since the pair played in London so this may well be a very special event, as will the ongoing Iberian Republica project which aims to give people around the world a proper and authentic taste of the DJ/production duo.